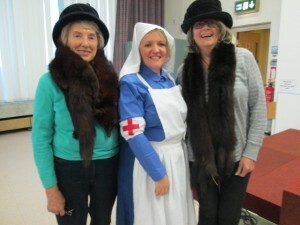 Suffragettes and a WW1 Nurse! We’re thrilled to have received funding to put on several school shows in the borough of Wigan called Poppies, Clogs & Bandages! We’ve gone back further in time to WW1 and are showing what life was like 100 years ago in the borough. We visit the Music Hall where soldiers were recruited and we step back in time in the old school room, but Nurse Aggie is one of the stars of the show – working at Wigan’s stately home, Haigh Hall, which was used as an auxiliary hospital in 1915. Thank you to people in Wigan, some in their 90s, who have shared ww1 family stories with us and for being an invaluable part of this project. Thank you also to all the school children and staff who have loved participating in this interactive, educational and entertaining show! Contact anna@blitzandbananas.com for more info.